One of the first subjects covered in a college economics course is commercial competition and the law of supply and demand. Individuals compete in buying and selling services and commodities of all kinds. As buyers, individuals seek to pay as little as possible for the goods, services, or property they want. But they find that others are also in the market for the same things and, as a result, they often have to pay more than they had planned. As sellers, individuals seek to dispose of their goods for the highest possible price, but since many others are trying to do the same thing they often have to settle for less than they had hoped. When the items being bought and sold are popular common stocks, the supply can often be insufficient to meet the demand. The result is an increase in the price of the stock, which brings forth a bigger supply from sellers and reduces the demand of buyers so that a temporary equilibrium is achieved. The supply is determined primarily by the number of shares in the capitalization of the company. A large company like General Motors, shown in Chart 10, has more than 285 million shares of common stock, while a relatively small company like Jack Eckerd, shown in Chart 11, has only about 17 million shares. Obviously, a strong demand for the shares of Jack Eckerd is going to have a greater effect in increasing the price of the stock than a demand of the same size would have on General Motors. 'capitalization imim m». . , . tm-tui WtHO . . C83.6HU. CM).ans . . m.ai.anm. CHART 11. JACK ECKERD CORP. This Florida drugstore chain had fewer than 400,000 shares of stock outstanding when it began its first superperformance price move in 1962. In 1966, when the second superperformance phase started, there were fewer than 800,000 shares. In 1970, at the beginning of the third move, the company had a capitalization of about 7,200,000 shares. Chart by Securities Research Company. favorable publicity, strong sponsorship, or theavailability of large sums of money for investment. Often it is caused by a new product becoming widely popular. The result can be strong bidding for a relatively small floating supply of stock, creating the classic situation for superperformance price action. Some of these strongest superperformance price moves have been the result of a severe imbalance between the limited supply of stock offered for sale and the strong demand by investors wanting to purchase the stock. When Syntexwas rising in a strong superperformance move in 1963, trading in the stock frequently had to be stopped because of the supply-demand imbalance. After a move in less than twelve months from under 10 to over 190, the move was finally broken by institutions offering large blocks for sale. Opportunities for big gains in the stock market are more likely to occur in relatively small companies than in companies with many millions of shares outstanding. Look for a small company introducing a unique product that is likely to become widely used. This is the combination that has time after time resulted in dynamic growth and volatile superperformance stock-price action. The contrast in volatility between low-priced stocks and blue chip stocks can be measured by comparing the performance of Standard & Poor's index of low-priced common stocks with the Dow Jones industrial average, which contains thirty of the largest corporations in the country. Four months after their 1974 bear market low, the index of low-priced common stocks was up 85 percent while the Dow Jones industrial average was up only 35 percent. When I bought KLM Royal Dutch Airlines stock in the mid-1960s at 106 3/4, the stocks of most airlines were doing well. The biggest problem was in selecting the airline stock that would perform best. I chose KLM because of its small capitalization; it had less than a million and a half shares of common stock at that time. In contrast, most of the other airlines then had over six million shares of common. In 1966 KLM was not only a stock with a small capitalization, but the floating supply was even smaller since many of the shares were closely held, 71 percent by the Dutch government. There was a large and growing short interest. The result was great volatility. By watching a stock of this type closely, on a daily basis, it is almost possible to predict its volatile moves. When the price jumped, heavy short selling would soon follow. Any price weakness would bring in short covering, driving the price up again. The monthly short-interest figures are summarized and published in the Wall Street Journal and other newspapers about the twentieth of each month. Many short sellers would cover their short positions prior to the publication of the statistics because they were afraid that an increase in the published figures would cause the stock to jump again, jeopardizing their short positions. I finally decided to sell my KLM stock because its chart showed an unsustainable spear pattern, a near-vertical formation, which often means heavy profit-taking and a price reaction. I decided to sell at about ten thirty on the morning the short interestwas published because I assumed that panicky short covering would run up the price of the stock on the day prior to the publication of the statistics and that a certain amount of this action would also occur shortly after the figures were released. I called my broker and told him that I wanted to sell all of my KLM that morning because I expected it to be the final top in the stock. I asked him how the stock was doing. "It's up about four points," he said. "Well," I replied, "if it is still going up there is no point in my selling now. I had expected it to top out this morning. Will you keep an eye on it and call me right away if it starts to drop?" He replied that he would. By eleven o'clock I had received no phone call. I was beginning to become apprehensive because I was absolutely certain, having watched the price action of the stock for a few months, that it would reach the final peak that morning. I called my broker again. "How is KLM doing now?" I asked. "Down four points," he replied. That summer morning in 1966 was close to the final top for KLM. From a price of 1553/4 in 1966, KLM eventually declined to 131/4 in 1974. This is another illustration that price superperformance moves in phases. The individual investor must be able to identify stocks early in their superperformance phase and sell when there is evidence that superperformance is approaching its end. When there is new evidence that the fundamentals of a stock, such as earning power, are weaker than previously estimated, the strong demand for the stock also disappears. The normal supply-demand relationship is severely distorted by the primitive specialist system still permitted to operate at the stock exchanges. 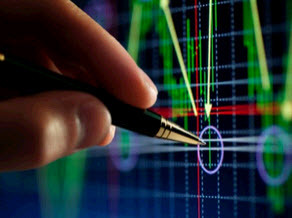 The specialists are stock exchange members who buy and sell on the floor of the exchanges and who are assigned by the stock exchange to make a market in specific stocks. In actual practice they are often the antagonists of the public investors. When stocks are rallying and the public is buying, the specialists are usually sellers and short sellers. Short selling is the selling of stock not owned by the seller. It is accomplished by borrowing stock. The short seller expects a price decline which would allow him to buy an equal number of shares at a lower price, permitting him to return them to the lender and to make a profit from the difference between selling and covering prices. Heavy short selling by specialists gives them a vested interest in having the stock's price decline to a lower level, so that they can cover their short sales and make a profit. The price decline is forced by heavy short selling at the top of the rally. The forced price decline cools buying pressures which might otherwise continue. In spite of heavy short selling, which drives down stock prices, over a longer period of time the normal buying and selling pressures should be more influential. Short sellers must eventually buy back or "cover" their short sales. Specialists have developed into a fine art their techniques for driving stock prices down. Theoretically they are supposed to be responsible for maintaining an "orderly market" by minimizing wide fluctuations in their assigned stocks by purchasing and selling for their own accounts. But their motivation to support prices often does not appear to be as strong as their desire to depress prices. During the spring of 1976 I happened to observe a stock listed on a regional stock exchange that had fallen 31/4 points, or about 19 percent in a single trading session, from 171/4 to 14. The volume of trading was only six hundred shares, so the specialist did not appear to be supporting the price, which rebounded the following day. On another occasion I noted a news item that appeared in a financial publication with the headline "Stock Exchange Fines, Censures Specialist." The news story described how an individual in a specialist firm allegedly failed to make an orderly market in a stock. He was charged by the exchange with opening the stock at too low a price, thereby triggering the sale of investors' stop orders, which were executed when the stock's price declined to specific levels. The opening price was the low for the day. 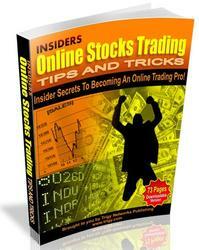 It caused stop orders for a substantial number of shares to be executed. These examples illustrate the hazards investors might face from the activities of stock exchange specialists. The strongest rebounds usually occur when the entire stock market is drastically oversold, as in 1962, 1966, 1970, and 1974. When the recovery begins, hundreds of stocks take part in the strong recovery action. Some manage within months to regain the price level that they possessed prior to the sell-off. Other stocks might not ever regain their former levels. The challenge to the investor is in attempting to identify the stocks that will rebound the fastest and the highest. On October 4,1974, stock market averages reached new lows in a bear market that had started in January 1973 for the Dow Jones industrials, and in December 1972 for more broadly based averages. 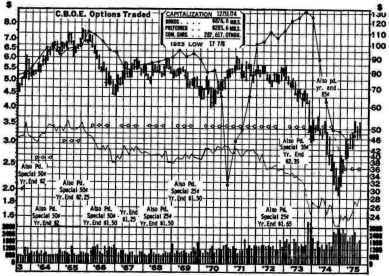 The Dow Jones industrials declined from a January 11,1973, high of 1067.2 to a Decembers, 1973, energy-crisis low of 783.56. 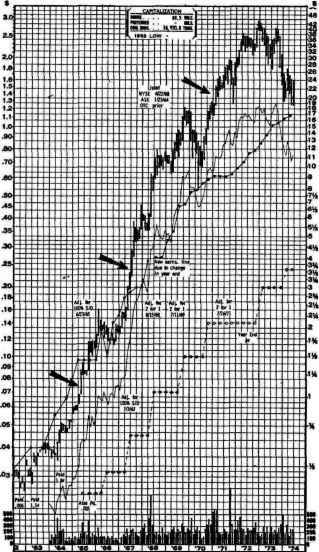 Following a rally in March 1974 to 878.13, the stock average began its long decline to the October 4 low near 573. The last stage of the decline included a precipitous drop of more than 200 points between August 7 and October 4, a Friday. On Monday, October 7, the market staged a strong rally; the Dow Jones industrials advanced 23 points. Following a 4.93 drop on Tuesday, the averages advanced an additional 55.54 points during the next three days to finish the week at 658.17. This was a typical "buyer's stampede" caused by large numbers of investors attempting to buy the bargains created by the severely oversold condition of the market. On the following Monday, October 14, the strong advance continued. During the six trading days the Dow Jones industrials had advanced more than 100 points. This type of strong rebound is typical of price movements at the bottom of bear markets. It indicates a major price reversal and is the best time to make purchases.